Every parent has faced the “party invitation” dilemma – the classmate who has invited your child to his or her birthday party, and you have no idea what to give this child for a gift. And when it is your own child sending the invitations, you know he or she doesn’t need any more toys or other potential presents. Cecil Carpenter solved this problem for his parents, and for all the parents and their kids that were invited to his birthday party when he turned 8. 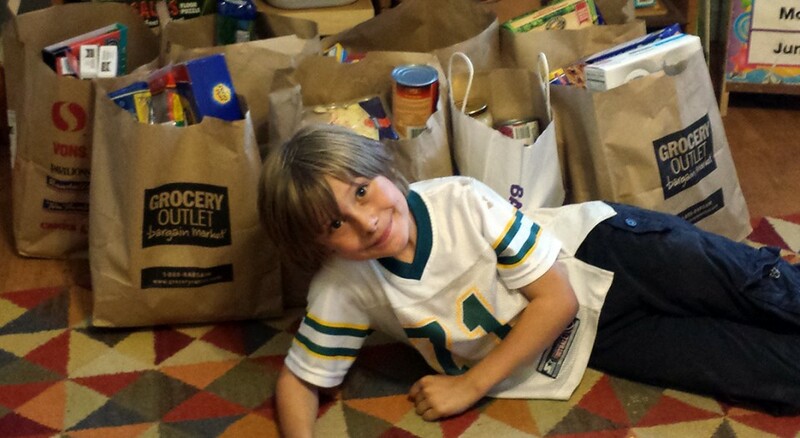 Instead of presents for himself, he requested his friends bring something for him to put in the food barrel at his church, St. Paul Lutheran Church in Oakland, Calif.
“I’m not sure why I asked for food the first year, but I wanted to help other people and wanted to be kind,” Cecil explained. He and his friends have contributed more and more food, and cash each year. This year they collected $63 and 109 food items, including boxes and bags of pasta, canned fruit and vegetables, tomato sauce, peanut butter and other items for the food barrel. Cecil still has his birthday party, but now his “gifts” go to someone who needs something to eat, especially during the summer when students don’t have access to free or low-cost breakfasts and lunches. Cecil and his friends get the good feeling from knowing they are helping someone else, and parents don’t have to wonder if they got the “right” gift. This idea has caught on at St. Paul. Other parents have told Cecil’s mother, Carolyn, that they are having an “alternative birthday gift” party for their child: One family collected books to donate, another took up an offering for the local animal shelter, and a third family asked for donations to the St. Paul food barrel. By the way, this was Cecil’s idea in the first place (not his mom’s). Cecil’s whole family – his church family and his birth family – has been inspired by his example and generosity and is more than just a little proud of him. For ideas on how to involve children, youth and adults in the fight against hunger – locally and globally – check out the ELCA World Hunger resources here. Karen Ball is a member of Trinity Evangelical Lutheran Church in Oakland, Calif.